Samuel Adams was born on September 27, 1722, in Boston, Massachusetts, the son of a woman of strong religious beliefs and of a prosperous brewer who was active in local politics. For this reason Adams was familiar at a young age with Boston politics and politicians. As an adult he would play a strong role in Boston's political resistance to British rule. The young Adams studied Greek and Latin in a small schoolhouse. He entered Harvard College at age fourteen. When he graduated in 1740 he was not sure what his career should be. He did not want to become a brewer like his father, nor did he want to enter the clergy. Although his father loaned him money to start his own business, Adams did not manage his funds well. As a result he went to work for his father's brewery after all. In 1749 he married Elizabeth Checkley. For serveral years Adams struggled in his career. He worked as a tax collector in Boston, but he mismanaged funds and had to pay the difference when his accounts came up short. There seems to have been no charge that he was corrupt, only extremely inefficient. After his first wife died in 1757, he married Elizabeth Wells in 1764. Adams's second wife turned out to be a good manager. His luck had changed, for he was about to move into a political circle that would offer political opportunities unlike any in his past. Adams became active in politics, transforming himself from an inefficient tax gatherer into a leading patriot. 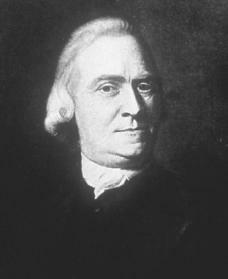 As a member of the Caucus Club, one of Boston's local political organizations, Adams helped control local elections in 1764. When Britain began an attempt to tighten control over its American colonies by passing laws such as the Sugar Act (1764), Adams was influential in urging colonists to oppose these measures. The Sugar Act was a tax law imposed by the British aimed at increasing the prices Boston merchants paid for molasses. Urged on by radicals in the Caucus Club, Adams wrote instructions to local representatives attacking the Sugar Act as an unreasonable law. Adams argued that the law violated colonists' rights because it had not been imposed with the approval of an elected representative. He argued that there should be "no taxation without representation." During the next decade Adams wrote essays about political ideas that were developing in Boston. Eager publishers hurried his writings into print. Meanwhile the British Parliament passed an even harsher tax law than the Sugar Act. This tax law was the Stamp Act of 1765, which placed a tax on printed materials throughout the American colonies. Adams's fiery essays and continual activities helped solidify American opinion against the Stamp Act. His columns in the Boston Gazette newspaper sent a stream of abuse against the British government. Riding a wave of popularity, Adams was elected into the Massachusetts legislature. Adams's next move was to protest the Townshend Acts of 1767, which placed customs duties on imported goods. His stand against the Townshend Acts placed him in the front ranks of the leading colonists and gained him the hatred of both British general Thomas Gage (1721–1787) and England's King George III (1738–1820). To protest the Townshend Acts, Adams and other radicals called for an economic boycott of British goods. Though the actual success of the boycott was limited, Adams had proved that an organized and skillful minority could effectively combat a larger but disorganized group. Adams wrote dozens of newspaper articles that stirred his readers' anger at the British. He appealed to American radicals and communicated with leaders in other colonies. In a sense, Adams was burning himself out. By the time of the battles of Lexington and Concord in Massachusetts on April 17, 1775, which marked the beginning of the Revolutionary War, his career as a revolutionary bandleader had peaked. Adams served in the Continental Congress between 1774 and 1781. However, after the first session his activities lessened and his ties to other leaders cooled. He was uncertain about America's next steps and where he would fit into the scheme. Adams served in the 1779 Massachusetts constitutional convention, where he allowed his cousin, John Adams (1735–1826), to do most of the work. He attended the Massachusetts ratifying convention in 1788, but he contributed little to this meeting. Although his political power had lessened, Adams served in political office for several more years. He was the lieutenant governor of Massachusetts from 1789 to 1793, when he became governor. He was reelected for three terms but did not seek reelection in 1797. Samuel Adams died in Boston on October 2, 1803. Alexander, John K. Samuel Adams: America's Revolutionary Politician. Lanham, MD: Rowman & Littlefield, 2002. Jones, Veda Boyd. Samuel Adams: Patriot. Philadelphia: Chelsea House, 2002. This says that he was remarried in 1764 and his luck ended up changing, but i read in another article that in 1764 samuel adams' job was lost. I am not sure which is right and which is wrong, but i do believe that one or both of you should change your information. Overall, your article was great. Good luck in the future. Did Samuel Adams make a Thanksgiving Proclomation? There is not enough info on here. I wanted his Adult life and got nothing.